We all love to play and watch the game of basketball. Millions of people love to play and watch this game as amusement, excitement, thrill and action is associated with this game. It gives immense pleasure to see 6 players of each side, struggle with each other to get the possession of the ball. The player needs to shoot the ball in the hoop in order to score the point. The basketball uniforms are certainly the most important part of this game. It is mandatory for the players to wear these in order to come on the court. These are available in the plethora of designs and shades. Nowadays, the leading brands, manufacturers, as well as online stores, are offering their collections in amazing designs and shades in order to meet the requirements of the sports industry. Why? The reason behind this is that it is the desire of every player to look great on and off the field. There is nothing wrong in this. The appealing outfits help in improving your confidence level. The same is the case with the players. All they want is to wear attractive shades, during the game also. In order to cater to their requirements, the designers are crafting their collections in the comprehensive range of shades and patterns. Gone of the days, when players loved to wear simple designs. Nowadays, they need outfits which not only manifest beautiful designs but also help in boosting their personality. The customized basketball uniforms are becoming popular day by day. The reason for this is that it is the desire of every club or team to have the unique identity in the court. For this purpose, they need unique shades for their teams. The customized collections are created as per the requirements of the teams and clubs. These collections contain notable features like the logo, team name, etc. These features also help in popularizing the club in the neighbor areas. How sublimation printing technology helps in providing impeccable design range? This is a versatile digital printing technique which helps in providing high-definition prints on the fabric. Using this technology, it is possible to embed the designs which are created using the computer based software on the fabric. In this technique, first of all, the computer made designs get imprinted on the transferable paper. From the transferable paper, these designs get embed on the fabric with the help of heat and pressure technique. The best option to get the collection is to buy directly from the basketball uniforms manufacturers. The reason for this is that these people offer the best quality apparels at most competitive rates. 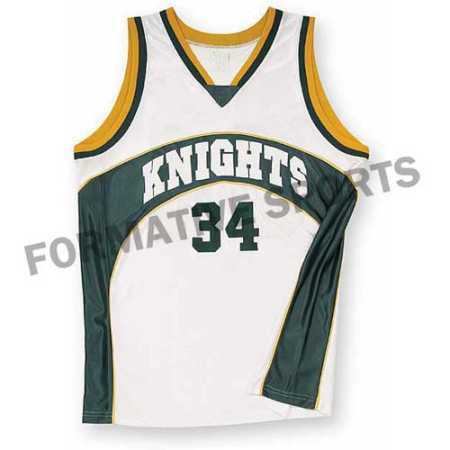 Formative Sports is counted in the list of prominent basketball uniforms manufacturers. Contact us to get customized basketball jerseys at most competitive rates.